1892-O Barber Half Dollar is a key date from the New Orleans Mint. In 1892, the United States Mint began issuing a new type of dime, quarter, and half dollar. All three denominations carried the same version of Lady Liberty. The quarter and half dollar shared the same reverse. The new coins were the work of Mint Engraver Charles Barber. Accordingly, numismatists named the type after its designer. Barber coinage continued until 1916. Mintage of Barber Half Dollars at the New Orleans Mint during their first year was stopped after only 390,000 coins were stuck. This proved to be one of the smallest mintages of all the Barber Half Dollar series, and contributes to the key date status of the 1892-O. In lower grades, the 1892-O rises above its Barber Half siblings in terms of value. However, in higher grades, its prestige levels out. An important variety of the 1892-O is the “Micro O”, which is characterized by an exceedingly small “O” mintmark. It is the most valuable Barber Half Dollar, regardless of condition, and is worth the extra investment. The 1892-O Barber Half Dollar is considered one of the most important key dates of the Barber Half Dollar series. The 1892-O with "micro O" is a variety of the same date, and is the only Barber Half Dollar in lower grades worth more. The percent price increases since Year 2000 of the 1892-O are graphed by the blue line above. In G-4 condition, it has increased in value about 2.5 times since then. 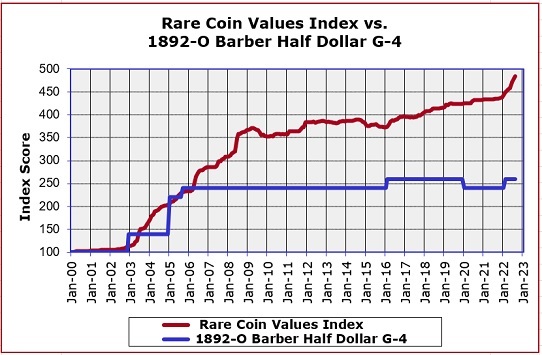 As impressive as this might be, the performance of the 1892-O is a little on the weak side compared to the Rare Coin Values Index, which tracks the percent change over the same time period of a pre-selected group of 87 rare US coins, the purpose of which is to understand the strength and direction of the overall rare US coin market. The 1892-O half dollar is one of the 87 coins that comprise the Index. The Index is updated monthly.